As the largest and most significant location in the Northern Territory, Darwin understandably comes with some of the region's most noteworthy tourist attractions and nearby national parks. Of course, it is the beaches lining the coastline that particularly appeal to sunseeking holiday makers, while in the Wharf Precinct, tourists may like to check out the Indo-Pacific Marine Exhibition and the adjacent Australia Pearling Exhibition. 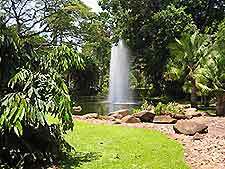 Visitors to the George Brown Darwin Botanic Gardens will see lush vegetation and enjoy a wealth of exotic flora within these cool and shady grounds. For something a little more unusual, allow time to tour the extensive WWII Oil Storage Tunnels, or perhaps pay a visit to the Crocosaurus Cove to see the giant albino crocodile. There are many cycling tracks in and around the city, with group rides regularly organised by the Darwin Cycling Club. The club was established way back in the middle of the 1950s and regularly stages road-racing events during the dry season. Worth looking out for is the annual Bark Hut Classic, which begins on the Arnhem Highway and finishes at the Humpty Doo Shopping Village, a route of just under 80 km / 50 miles. Both the Top End Tour and the Around the Bay (Darwin to Mandorah) are further yearly events and tend to be well-supported by friends and family. 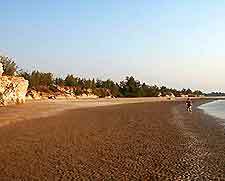 Popular beaches around the city include Mindil Beach, Vestey's Beach and Mandorah. However, before you jump into the water for a swim, it is worth noting that there is a seasonal danger from stinging box jellyfish - between October and May. Occasionally crocodiles are caught in these areas as well, so do look out for any warning signs. Located within the Wharf Precinct and just across from the Convention Centre, the Indo-Pacific Marine Exhibition is an exciting marine aquarium, displaying tanks of marine creatures and organisms. The exhibition began its life in 1971 and is full of interesting sea life such as clown fish, butterfly fish, sea horses and a spectacular living coral reef. For something quite different, there are also evening tours, where visitors are able to view the occupants of the reef tanks with supplied torches - seafood dinners are included as part of the package. Although this attraction is fairly small, it is interesting and the guides are both knowledgeable and enthusiastic. An interesting display dedicated the farming of pearl oysters, the Australia Pearling Exhibition is held in the same building as the Indo-Pacific Marine Exhibition and may be of interest to those visiting the adjacent aquarium. A video loop explains all about the local business and exhibits. Take a self-guided trip through five WWII oil storage tunnels, built underground after the Japanese destroyed all of the oil tanks above ground. Located within the Wharf Precinct, the tunnels were built to protect the city's oil supplies during WWII. However, this monumental task was not completed in time and so the tunnels were never actually used. They were reopened in 1992 to mark the 50th anniversary of the city's bombing. Visitors will be able to see much military memorabilia, including old photos and posters. Of note, you should allow somewhere in the region of an hour for your visit. Established in the 1880s and located roughly 2 km / 1.5 miles to the north of the Central Business District, these botanic gardens cover roughly 100 acres / 40 hectares and comprise mangroves, native plants and many tropical species, including palms and cycads. 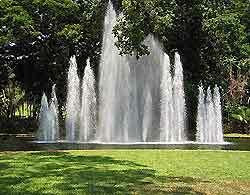 Next-door you will find the Mindil Beach Reserve and the Skycity Casino. The neighbouring Darwin Crocodile Farm at Palmerston is located approximately 40 km / 25 miles from central Darwin and features over 30,000 sea and freshwater crocodiles, being the biggest farm of its kind in the whole of Australia. However, this farm has closed to members of the public, with the most impressive of its former residents now living in the city, as the farm's sister attraction, the Crocosaurus Cove, which is based on the corner of Mitchell Street and Peel Street. Visitors can get to admire large crocs, including a giant albino croc, while you can also handle some of the youngsters and even go for a swim with some giants, in the protected 'Cage of Death'. A number of other reptiles are also on exhibit, including snakes and lizards. Darwin is close to many national parks, all offering a wealth of wildlife and breathtaking landscapes.